Kajaani is a town and municipality in Finland. On the 8th (Sat), take in the architecture and atmosphere at Paltaniemi Church, explore the historical opulence of Kajaani Castle ruins, appreciate the history behind Pietari Brahen Patsas, then take in the architecture and atmosphere at Kajaani Church, then get great views at Vuokatinvaara, and finally perfect your strike at Vuokatti Bowling. To see photos, traveler tips, reviews, and tourist information, use the Kajaani trip maker tool . Amsterdam, The Netherlands to Kajaani is an approximately 12.5-hour flight. You can also drive. The time zone difference moving from Central European Time (CET) to Eastern European Time (EET) is 1 hour. Traveling from Amsterdam in December, expect Kajaani to be cooler, temps between -4°C and -11°C. 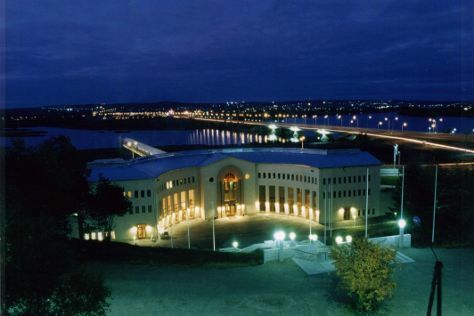 Finish up your sightseeing early on the 8th (Sat) so you can travel to Rovaniemi. On the 9th (Sun), make a trip to Lordi's Square, take an in-depth tour of Arktikum, then take in the views from Lumberjack's Candle Bridge, then see Santa Claus Office, and finally get in on the family fun at Santa Claus Village. On the 10th (Mon), you'll have a packed day of sightseeing: don't miss a visit to Marttiinin Wanha Tehdas and then find something for the whole family at SantaPark - the Home Cavern of Santa Claus. To see more things to do, other places to visit, traveler tips, and other tourist information, read Rovaniemi sightseeing planning app . You can drive from Kajaani to Rovaniemi in 4 hours. December in Rovaniemi sees daily highs of -6°C and lows of -13°C at night. Finish up your sightseeing early on the 10th (Mon) so you can travel back home.